The season continues to be busy for Ros and her horses. 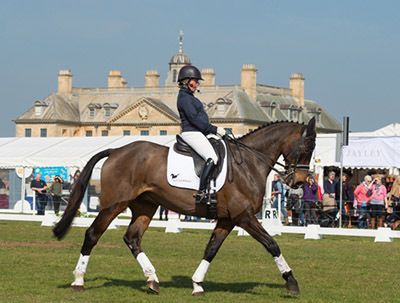 She was riding at Belton – albeit doing the Guinea Pig (test) dressage on Zenshera and then giving a dressage/warm up demonstration on Allstar B in the main arena. Those competing her horses have bagged more good results. No Excuse jumped a steady cross country clear at Gatcombe with Tom McEwen, before winning the Open Intermediate at Belton last weekend with a smart 24.1 dressage score and double clear. Also with Tom, Rehy Royal Diamond was just out of the ribbons in an intermediate section at Gatcombe, Tom having kept the pace steady across country. Finally Lordships Graffalo won an Open Novice at Gatcombe and placed third at Belton, both times with a double clear and good dressage test. Richard Jones rode Grafics at Belton, posting their third double clear on the trot and placing 5th in a novice section. Finally Ros’ head girl Georgie had two novice runners at Belton, Fabris and her own TS Shanghai, both finishing on their dressage scores in third and fourth places respectively.